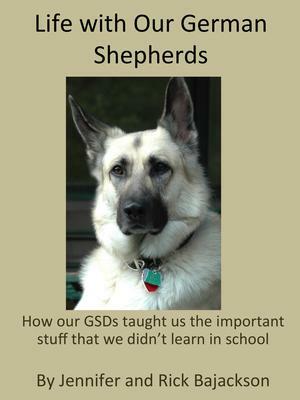 I recently authored a book on German shepherds, Life with Our German Shepherds, relating information that they taught me. The book is around 145 pages and is available on Amazon and is an Ebook. All of the author's proceeds will be donated to various GSD rescues. I am literally not taking one cent from authoring this book. I believe that getting this information into the hands of GSD owners will be my pay back. I am scheduled to donate $1000 to Training Rescue Dogs (info@trainingrescues.org) for a rescued German shepherd (Blue) next week and have donated $400 to a local GSD rescue. With regard to Training Rescue Dogs, this amount will be the balance of the training expense for Blue. Any additional sales of the book will accrue to similar organizations. Here's the synopsis which appears on Amazon. The authors have written this book in order to pass along their important, and sometimes life-saving lessons they have learned with their own German shepherds. If you have a German shepherd, have given serious consideration to acquiring one of these fine dogs, or are a German shepherd fan, the sometimes difficult “lessons” in LIFE WITH OUR GERMAN SHEPHERDS are an absolute necessity. More's the case if you are thinking about adding a German shepherd to your family. Issues like feeding a raw food diet, knowing and recognizing what constitutes an emergency medical situation, where to get your shepherd, methods of training your dog, what to expect from your veterinarian, when to resort to the ER Veterinary hospital, the numerous benefits of swimming your dog, and many other topics are addressed in this book. We believe that our "dog house" wasn't right unless we had at least one German shepherd living with us. So this book spans a good fifty years of experience with our dogs. I've been planning this book for several years and hope that the German shepherd owners who read it, and anyone planning on getting a GSD, will gain from reading our experiences with: Ping, Rex, Prince, Pasha, King, Shalimar, Kelsie, Raisyn, Sarek, Graeson, Berin, as well as the foster dogs that we've given a "temporary home" to while they find their "forever home". In these dogs' memory, we’re going to donate all of our net proceeds from the sales of this book (all of the royalties that the authors receive from Amazon) to the various German shepherd rescues and other organizations that provide research on diseases common to the German shepherd breed such as Degenerative Myelopathy." If you care to advertise Life with Our German Shepherds, please do so. I will be adding your book to my Kindle, because I believe, after reading your page on Amazon, that you do not need the proceeds from this book, which sells on Kindle for $1.99, and donating the proceeds is fantastic. I also enjoy reading articles / books about GSDs because no one knows how marvelous these beings are until you have lived with one. Notice I didn't say "owned one". We are on our second wonderful Shepherd, having fostered, then adopted, a senior from our local shelter. We then acquired a puppy from a friend three years ago. There are no words...but I will joyfully read yours!